The tactile relationships we share with the objects we use every day can have a big impact on the way we use them. Our typical keyboards, for instance, come with bumps on the F and J keys to show where our index fingers should rest while in “home position.” Other than those little bumps, however, there aren’t many tactile clues to where our fingers should be resting or pressing. 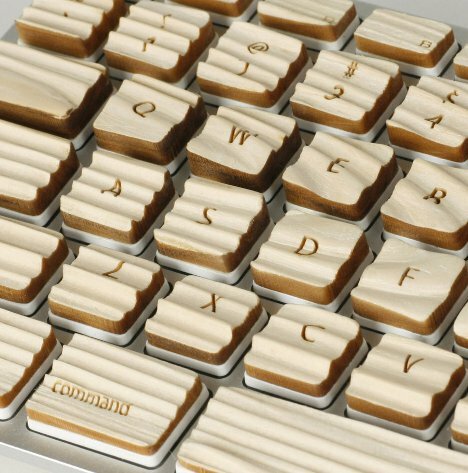 The Engrain Tactile keyboard from designer Michael Roopenian adds a rich tactile experience to our typing by giving the keyboard a wood grain texture and unique feel for each and every key. 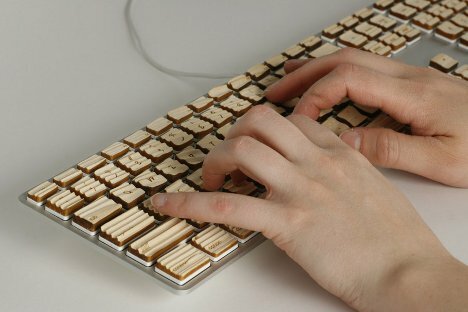 The keys are all covered with textured sandblasted wood, each making up a small part of the larger overall pattern. A lot of research went into the design of the Engrain, including studying which keys are used the most and how users move their fingers across the keys. The result is a keyboard that is both beautiful and easy to use, giving our fingers something to tell our brains that they’re in the right place without requiring our eyes to look down every sentence or two. See more in Computers or under Gadgets. August, 2012.